Blog Quick Quotes: Inspired Design - 3 new project ideas! Inspired Design - 3 new project ideas! Did you miss yesterday's poll & giveaway? You can still participate through Sunday night! Today we are sharing 3 new projects from Adora, Lisa & Michelle. We'd love to hear what you think about the new QQ line 'Copper Kettle' that is featured in these projects. I love autumn, where the air is crisp; the leaves turns into brilliant colors and falls to the ground. Gorgeous red, yellow and orange trees line the roadside makes me look forward for the just normally a routine drive home from work! What do you like about fall??? 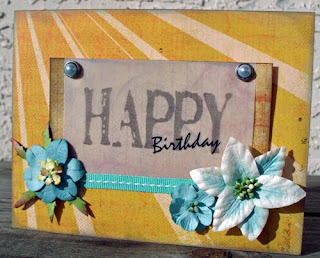 Today I will share with you this layout I made using the gorgeous QQ Nov. Option A Kit! With the color of fall this kit is the perfect match with my theme and photo. Changing the color of the photo using photoshop is a great technique that makes everything on this layout ties together. I love these pics of my son with grandpa playing the guitar. Music was always a part of my childhood and I love that my dad is now sharing that with my son as well. This page features the new QQ line "Copper Kettle". Most of the items on this page were included in the Monthly Kit Club for Nov. I added the frosted flourishes in the corner and some ribbon from my stash. 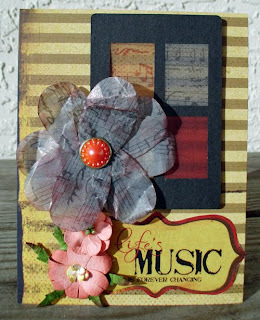 The new Copper Kettle papers are very versatile and I love that almost any color will match the papers well. For this Card, I added some blue Petaloo flowers that I had left over, unknown ribbon, My Mind’s Eye Brads and a Quick Quotes Vellum Quote. I inked the edge of the card with a Tahiti Powderpuff Ink Pad. A completely different feel is accomplished when adding a salmon colored Petaloo flowers to the papers. I used one of the diecuts from the kit and added the three different colored vellums behind the openings so that it would look like a stained glass window. The Vellum flower was made by following the directions in the kit and I placed one of the salmon brads in the center of it and used the Life’s Music is Forever Changing sentiment. I also used a Bloody Mary Powder Puff Ink pad for this card.